Dinosaur Bite Applique Alphabet featuring everyone's favorite, T-Rex! Includes letters A thru Z. Font shown (the name Matthew) is Marky Marker Embroidery Font and is available as a separate purchase. 4x4: 3.71 x 3.87 inches. SC: avg: 6433. 5x7: 5.00 x 5.23 inches. SC: avg. 8892. 6x10: 6.00 x 6.26 inches. SC: avg. 10,923. 8x8: 7.48 x 7.81 inches. SC: avg. 14,283. Dinosaur Bite Applique Alphabet featuring everyone's favorite, T-Rex! Includes letters A thru Z. Font shown (the name Matthew) is Marky Marker Embroidery Font and is available as a separate purchase. 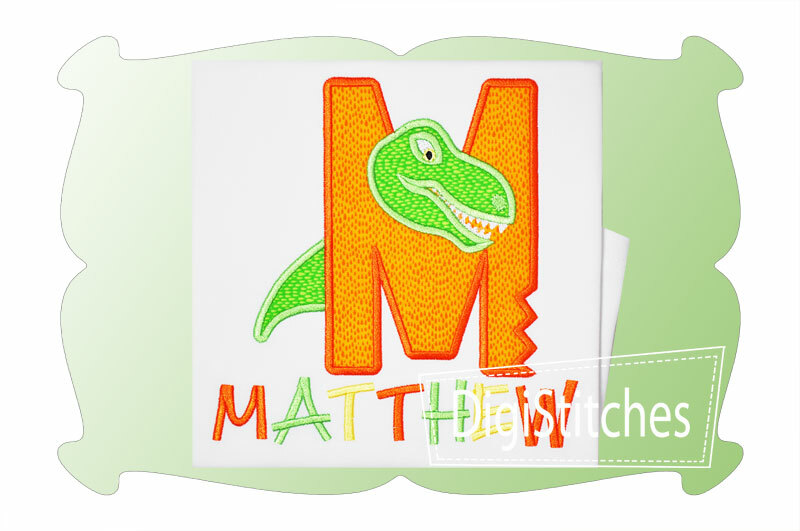 Dinosaur Bite Applique Alphabet comes in 4 sizes. All sizes included with your purchase!